The San Antonio Spurs shook off their embarrassing Game 1 loss to Houston and returned the favour – handling the Rockets 121-96 and levelling the series at a game apiece. Kawhi Leonard, who flirted with a triple-double (34 points, seven rebounds, eight assists), led the Spurs to a redemptive Game 2 victory in which they became the first team to hold Houston below 100 points in the postseason. San Antonio’s increased defensive urgency was evident from the tip-off as they chased the Rockets off the three-point line throughout the game. San Antonio’s aggressive defence on the perimeter limited the Rockets to just 11 of 34 from beyond the arc – compared with their historic 22 of 50 effort in Game 1. 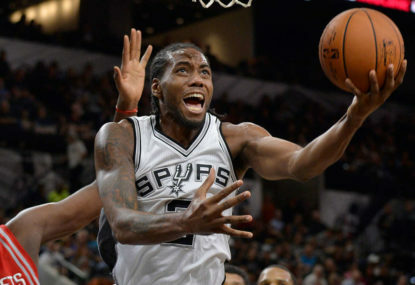 Crucial to San Antonio’s defensive improvement was the adjustment Greg Popovic made in switching Kawhi Leonard – arguably the best defensive player in the league – onto James Harden. With Leonard guarding him, Harden was limited to 13 points on a horrendous three of 17 shooting night. Another tweak that Popovic made was starting veteran Spanish centre Pau Gasol over David Lee. Gasol was dominant on the glass, grabbing six offensive rebounds and registering four blocks as the Spurs out-rebounded the Rockets 47 to 32. The Spurs used this dominance inside to open up an early lead and although the Rockets kept it close through three quarters, San Antonio never trailed. However, in the final period, the Spurs locked down defensively – holding the Rockets to just 13 points – and pulled away comfortably. Houston pulled to within three late in the third but that was as close as they would get – they went ice cold in the final period. The Spurs slowed the game down in final period, playing the game at a pace that suited them instead of the frenetic pace of Game 1. Houston simply couldn’t live with San Antonio’s defensive energy in the fourth quarter and a 23-5 Spurs run sealed the game up for Greg Popovic and his men. Australian guard Patty Mills did a nice job off the bench, leading the second unit with impressive ball movement and finishing with seven points and three assists. Mills’ performance was highlighted by a ridiculous spin move on Patrick Beverley, putting Houston’s defensive specialist in a blender and promoting a call of “Aussie, Aussie, Aussie” from commentator Reggie Miller. Fellow international guard Tony Parker rolled back the years and poured in 18 points on an efficient 8 of 13 from the floor. Parker drained mid-range jumpers like it was 2007 but was carried off the court in the final period and did not return. However, it was Kawhi Leonard who really turned it on last night. He showed again why he is arguably the finest two-way player in the league, playing lock-down defence while also dominating at the offensive end. Leonard hit a ridiculous 13 of 16 from the field as he showcased his clinical array of offensive moves. He may not be the flashiest player in the league but he is ruthlessly efficient and goes to work with a cold clinical edge that is hard to slow down. Since his breakout performance in the 2014 NBA Finals, Kawhi has had a disappointing play-off record, winning just one series in the past two seasons. He looked hungry to improve on that record last night and ready to lead his team on a deep championship run. The series is delicately poised as it switches to Houston for Game 3 on Friday night. The Spurs will be looking to reclaim home court advantage while the Rockets will look to seize control by defending their home floor.